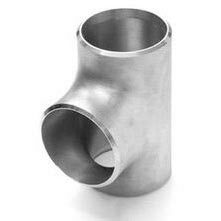 Providing precise connections for pipes on an industry-wide basis, our range of Buttweld Tee is repeatedly demanded in the market. The Buttweld Tees provided by us, are a result of expert designing and engineering, easing their installation and enhancing their performance. Made to handle high stress and shock, the Buttweld Tee offered by us is repeatedly demanded by clients all over the world.